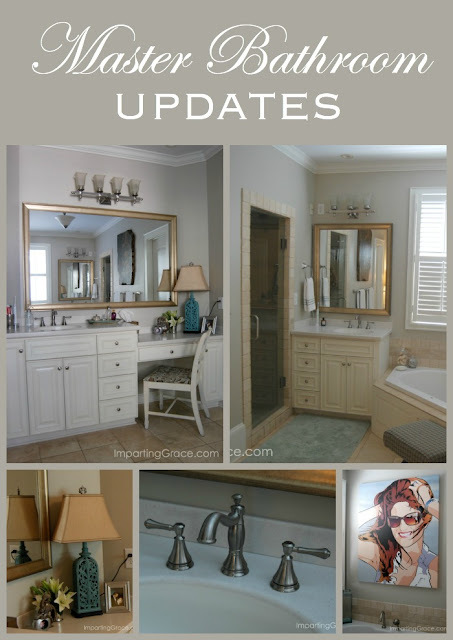 It's been quite a while since I've written about what I've been doing in our home, but today I'm glad to share with you the updates that we've made to one of the rooms we use the most: our master bathroom. Isn't it funny how long it can take us to get around to working on spaces that aren't in the public eye? Yet room like this play a major role in our daily lives. 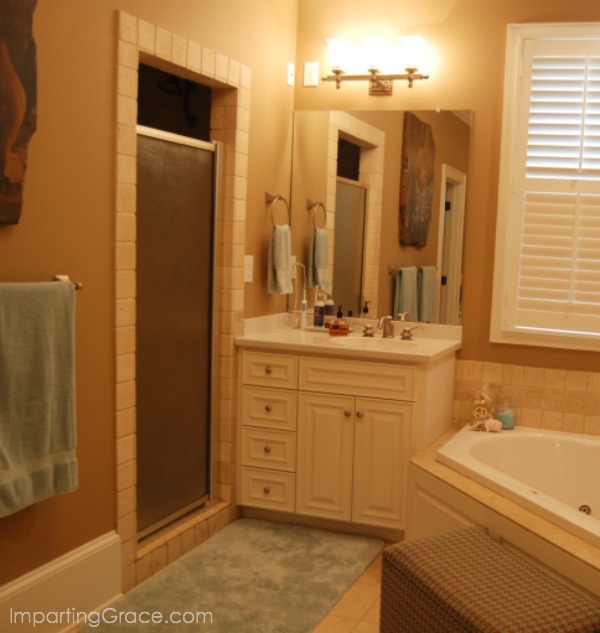 Here's what our bathroom looked like before. Not horrible, but a little dated and a little too much on the brown side. The tumbled marble tile work was fine with me, which was a good thing since our budget wouldn't accommodate such a big change. 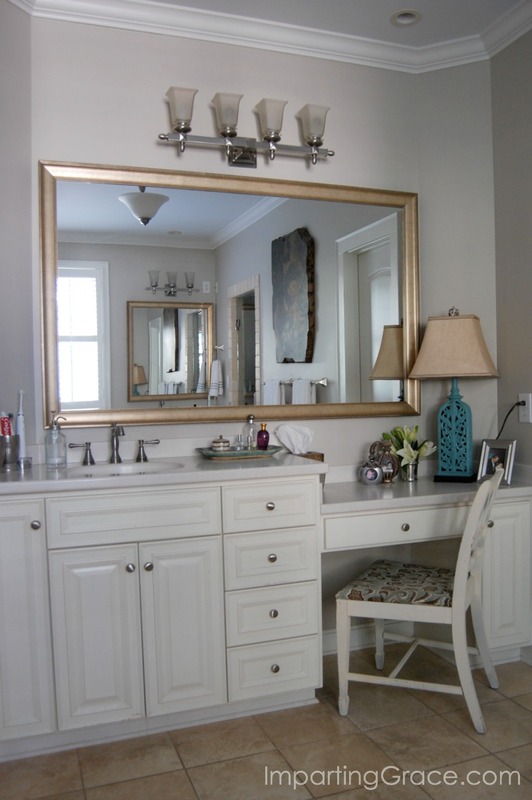 But I wanted to de-emphasize the brownish tones, so I painted the walls with Benjamin Moore Revere Pewter. This "greige" color still works fine with the tumbled marble; in fact, it's a close match to the groutwork in the tile. 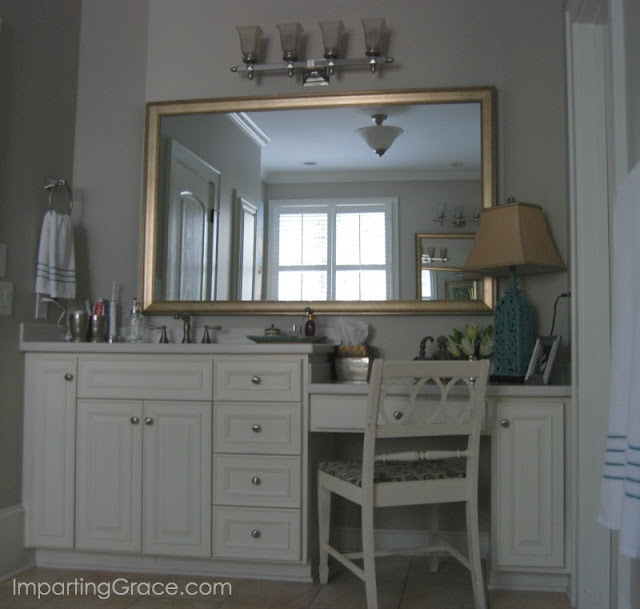 Once the room was lightened up with new paint, we could move on to other changes. 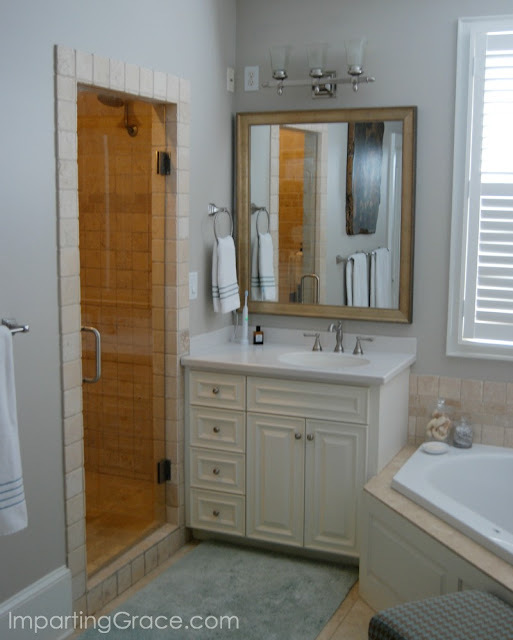 The one element of the old bathroom I really disliked was the shower door, so changing it was the biggest priority. I really like the new glass door. Unfortunately, replacing that door ate up most of our budget, so we had to prioritize other changes. 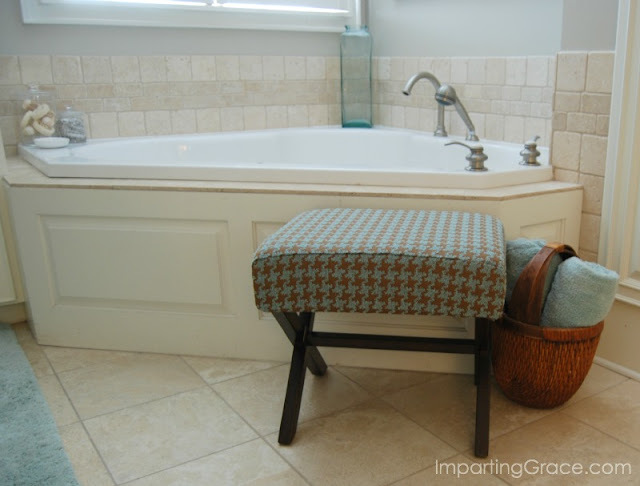 I would have loved to have a beautiful claw-foot tub, but decided that the existing jetted tub was fine for now. I still love the Lichtenstein-style portrait of me that my husband had made (you can read the story behind this portrait here). 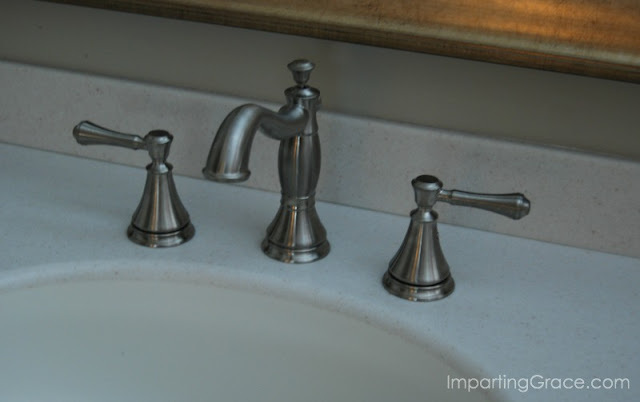 The new faucets are from the Cassidy line by Delta, and we're very happy with them. The faucets for our shower and tub were fine, so we just replaced the sink faucets. We stuck with brushed nickel so that the new faucets would play nicely with the old ones. The other big change was the mirrors. As you can see above, we had huge expanses of plate-glass mirror. They were in fine shape, but I was ready for a change. I considered framing the old mirrors, but ultimately decided against that. I was especially tired of the L-shaped mirror over my sink and vanity area. After measuring three times to be absolutely sure of the dimensions, I chose a fairly inexpensive but substantial-looking molding and had the mirrors custom-made at my local frame shop. I think the new mirrors make a big difference in the look of the room. The other changes I made were all very inexpensive or even free. 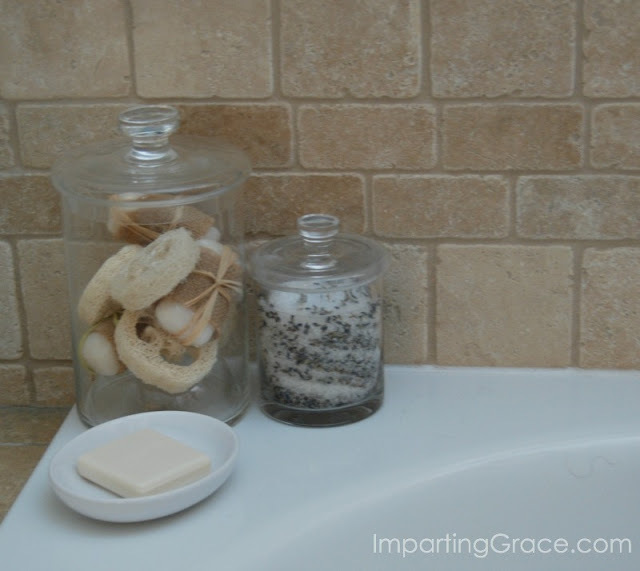 I simplified and updated the accessories around the tub. I filled one of my apothecary jars with gorgeous lavender bath salts that a friend made for me; aren't they pretty? They smell heavenly. The white soap dish I found at the dollar store. I re-used some of my old houndstooth fabric to cover an inexpensive X-leg ottoman from Target's Threshold line. My vanity chair got recovered with some fabric left over from another project, and I re-used my old lamp after spray-painting it with Valspar's Secluded Garden. I'm so happy with our lighter, brighter space! The only big-ticket item in our mini-remodel was the shower door, but I think we succeeded in updating our space significantly with several small changes. It looks great! I like that the colors are fresher. I even have the same swanky dollar store soap dish. What a great update! The new glass shower door was worth whatever price you had to pay to get it as it looks super classy. The new paint color really brightens the space and looks more modern. 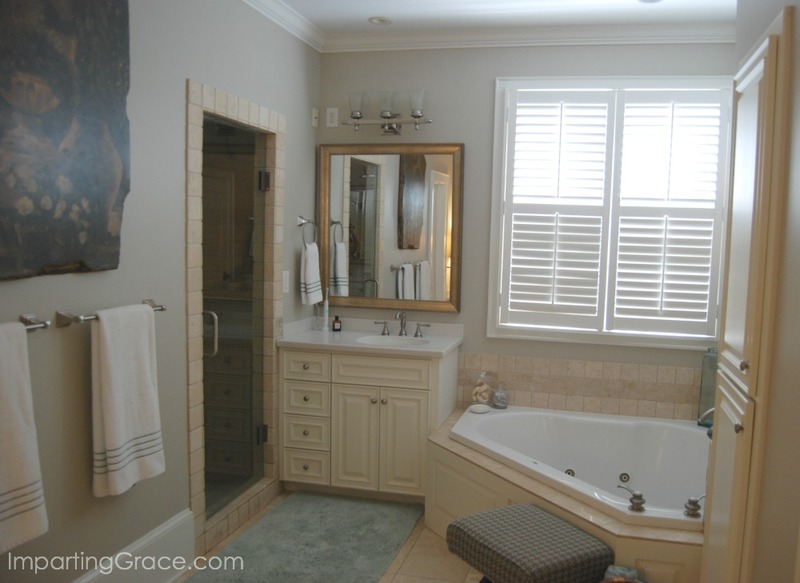 You are lucky to have such a nice bathroom! It's gorgeous. I love the new color, so pretty. Your room looks great, Richella. 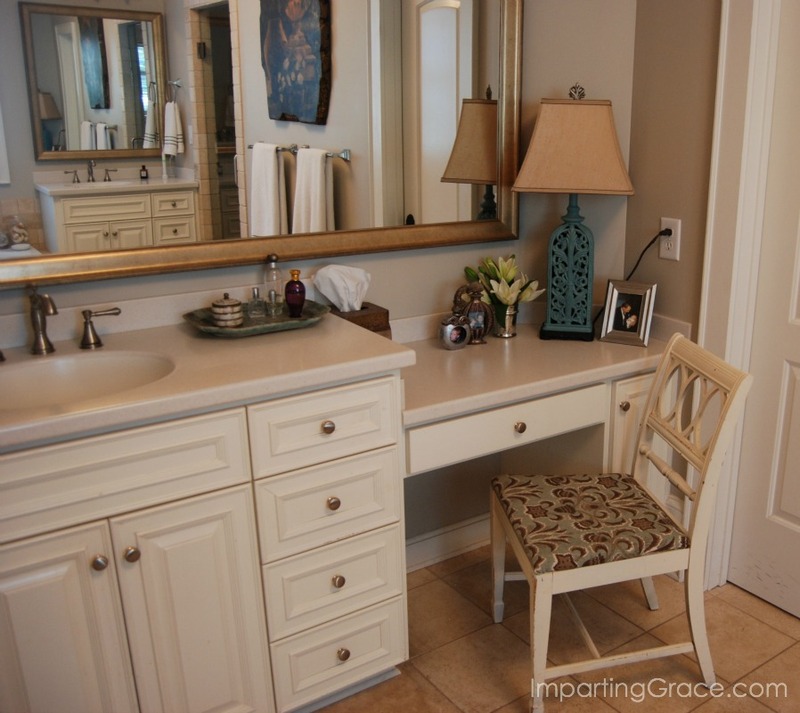 Bathrooms work so hard and they definitely need touch ups along the way. I'd love to have a claw foot tub too. I wonder why builders put in these huge jetted tubs with all the tile around them. Loving the update Richella...the paint certainly did refresh the room...Love all of your beautiful touches and that painting is amazing!!! Your room looks lovely, Richella! I was keeping my fingers crossed that you had not moved that gorgeous portrait of yourself....yay, it's still there! 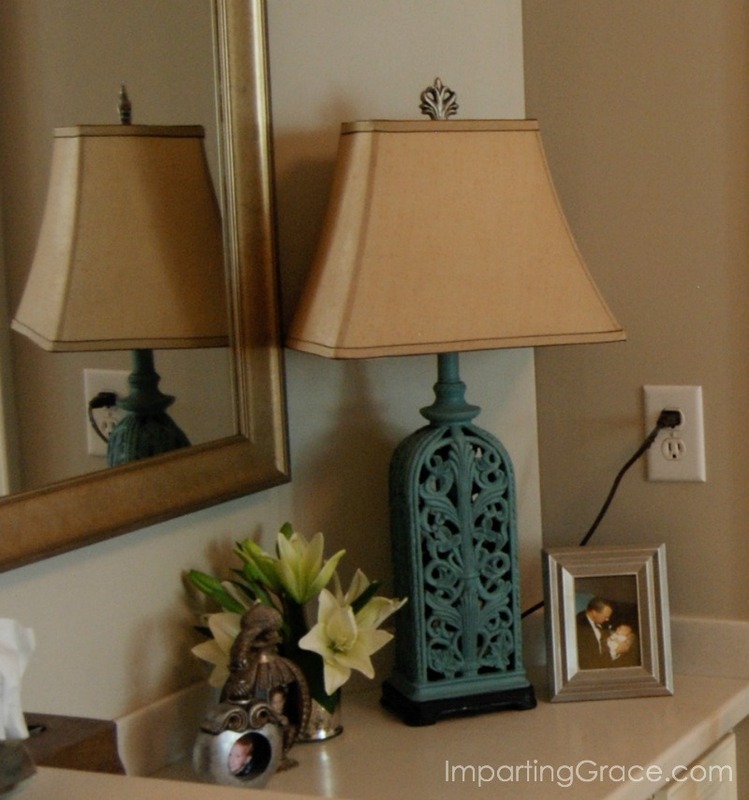 I stand all amazed in what a can of "good" paint can do to uplift a room's mood!!! Love the new hue you've chosen to complement your existing tiles!!! The updates on the mirrors is stunning!!! 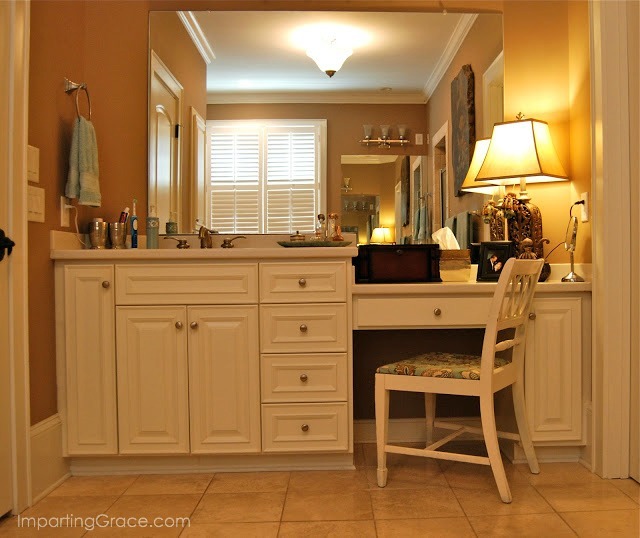 and has me thinking about ours in the Master Bath!! !